MEANHORN: Wanna Buy a National Championship Ring? Free Shipping!... Well, Too Late. Wanna Buy a National Championship Ring? Free Shipping!... Well, Too Late. 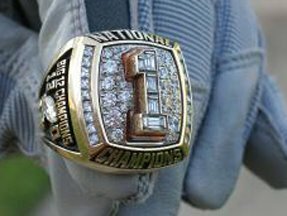 A University of Texas National Championship ring showed up on eBay this weekend with a $10,500 reserve and a buy-it-now price of $20,000. Early this Wednesday morning the seller ended the auction early citing a mistake in the listing. The seller claimed that the ring once belonged to a former player (mentioned it six times) but that only the buyer would learn that player's name. The auction peaked the interest of almost everybody. Even the Texas athletic department is looking into it. It turns out that it would be a violation of NCAA rules for a current player to receive money for the ring. The hand in the pictures is wearing player's gloves. This auction was this eBay user's first as a seller. Judging from the user's previous purchases, he was into Magic: The Gathering and other such card games for quite a run there in 2004. The seller was awake to end the auction between 4 a.m. and 6 a.m. CST (probably playing Magic). Conclusion: It's Vince Young. Case closed. To see VIDEO of the ring presentation, look here. Here's a cache of the auction page as it looked while it was still active. UPDATE 5/24/06: A new listing popped up today with a revised page design (cached version). This time the seller added that, "This is NOT the ring of a player who may have been dismissed from the team!!!" Either way, once again the auction was ended early by the seller, this time claiming that the ring is no longer available for sale. Each of these auctions cost the seller $55.40 in non-refundable listing fees. So it's someone with at least $110 to spend. Again... points to Vince Young. Believe me, I'm a very good detective--I've watched lots of Matlock.